How to Prepare Chiles en Nogada - Chiles in Nogada are very popular in Mexico during the month of August and September a Mexican tradition coming from Puebla. The history of San Miguel begins in the year of 1971 in San Miguel Allende, Guanajuato, Mexico. It was founded by Antonio Madrazo and his son Patricio. At the present time, San Miguel exports to more than 20 countries with the San Miguel brand including products such as: Mexican specialty sauces, creams and soups, fruits, vegetables, preserves and other dehydrated food products. 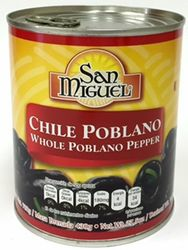 San Miguel: es una linea 100% Mexicana, con diversos productos como: Salsas para Acompa�ar, Salsas para Cocinar, Cremas y Sopas, Platillos preparados, Especialidades Mexicanas como Cuitlacoche, Flor de Calabaza, Rajas de Chile Poblano, Frijoles, as� como una amplia gama de Chiles en conserva como Toreados, Serrano, Jalape�os, etc. San Miguel / Sabores Aztecas se distingue por ser una l�nea de productos: 100% Mexicana, Tradicional, sin Conservadores y los mas altos est�ndares de Calidad. Always enjoy working with these peppers, but they are no longer available in my area. Was so glad to find them on-line. Can now make easy chili rellenos. Excellent for chile rellenos, poblano pie and more! Perfectly roasted and peeled. Whole, cleaned chilies. I can't keep enough in the pantry! The package arrived in a timely manner. The peppers are very fresh and in good condition and very tasty. I still have a few cans left and before they are gone I am going to request a refill. Being in NH can be tough finding fresh poblano peppers. Sometimes yes, sometimes no, so having these canned on hand has been wonderful. They are delicious. Comparing this to the Ortega brand of canned poblanos, I prefer these. They taste better and are less salty than Ortega. There are about 5 or 6 chilies to a can and the poblanos are pretty large in width. I also think that these are a tad spicer than other brands I have tried, but they aren't TOO spicy. The tops have not been cut off, which makes them great for stuffing for dishes such as chile rellenos, especially if you like to stuff them with alot of cheese and don't want it spilling out when you cook/fry them. Great item, glad it is back in stock. An absolutely wonderful product. I am from Canada and cannot purchase fresh poblano peppers anywhere. I have taken cooking classes in Mexico and I love this product to make some of the recipes I have learned. Please get them back in soon. We've found it difficult to find/buy canned or frozen poblano peppers, and fresh poblanos aren't always available where we live. So, we were very glad to find this brand available online. We appreciated that ALL items we ordered from MexGrocer.com were wrapped very nicely and securely; the package arrived quickly and in excellent condition. Thank you! !